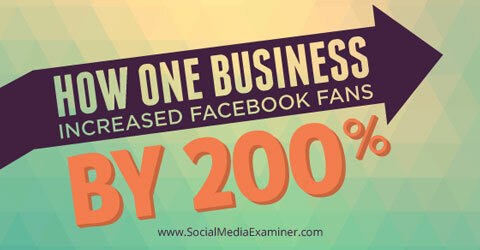 Do you want to grow your Facebook audience? Have you thought about using giveaways to educate your customers? 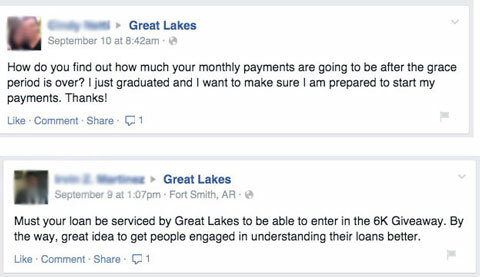 Great Lakes, a student loan service, used a Facebook giveaway to educate borrowers and open the lines of communication on a topic they suspected was confusing for their customers. In this article you’ll discover how they increased their Facebook following by 200% without like-gating their Facebook campaign. Recognizing that their customers may have difficulty understanding the details of their student loans, Great Lakes set out to inform and help their borrowers via a promotion. The company focused solely on Facebook and hosted a sweepstakes offering a $6,000 cash prize to be put toward an existing student loan. Find out how Great Lakes increased their Facebook fan base by 200%. The campaign resulted in more than 206,000 entries in just 18 days and 40,825 new Facebook fans—all without forcing a like. Here’s how they did it. The Great Lakes giveaway garnered 206,600 entries in 18 days. The campaign resulted in a 40,825 increase in likes and 626,000 campaign visits. Great Lakes tripled the number of fans conversing with their Facebook page. 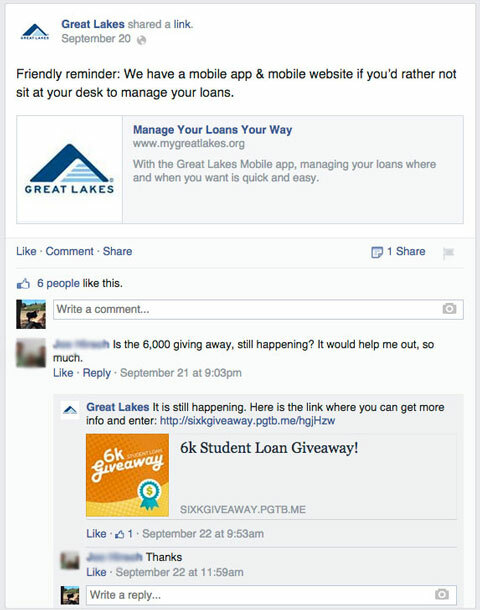 The primary goal of the 6K Student Loan Giveaway was to increase the size of Great Lakes’ Facebook audience to support customer engagement. The secondary goal of the sweepstakes was to increase account creation on their website. In a recent study 55% of consumers said they don’t want to be “friends” with a brand on social networks. Instead, they want to share product experiences, receive customer service and get responses to general complaints from a company representative. Great Lakes created a sweepstakes to educate borrowers and offer a $6,000 prize toward existing loans. Great Lakes believes that connecting with customers on Facebook provides an opportunity for customers to learn about their student loans a little at a time. 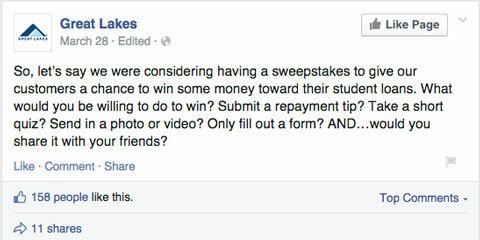 The Facebook page is a place where fans can reach out for quick answers to their questions about student loans. Great Lakes’ ultimate goal is to help their customers become financially successful. 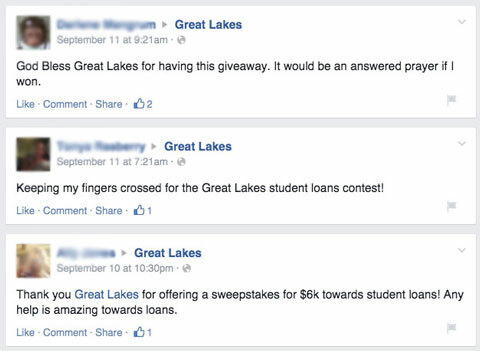 By clearly outlining these benefits in all 6K Giveaway promotions and not forcing, but encouraging, entrants to like the page, 20% of giveaway entrants chose to like Great Lakes’ Facebook page and continue receiving student loan information in their Facebook news feeds. Great Lakes’ goals opened the door for the company to position itself as a trusted resource for borrowers everywhere, whether they were existing clients or not. Great Lakes encouraged everyone who visited the page to ask questions or voice concerns about student loans. Great Lakes recognized that student loans—both the borrowing and repayment processes—can be frustrating and confusing. The company noticed that a majority of customers were reaching out via customer support channels and not utilizing social channels as much. When Great Lakes began discussing options for reaching their goals, they went straight to the source, their Facebook fans. Before launching their campaign, Great Lakes surveyed their Facebook audience to gauge potential success. By surveying their Facebook followers, Great Lakes was able to determine the effort fans would go through to enter a promotion and gauge whether a promotion would be a success. Based on the response of their fan base, they determined that it would be successful and developed a Facebook app for their 6K Student Loan Giveaway. When building a Facebook campaign, the goal should be to engage with your audience, but not make it difficult for them to enter your promotion. Great Lakes found their balance in offering an educational quiz fans could choose to take before entering their promotion. 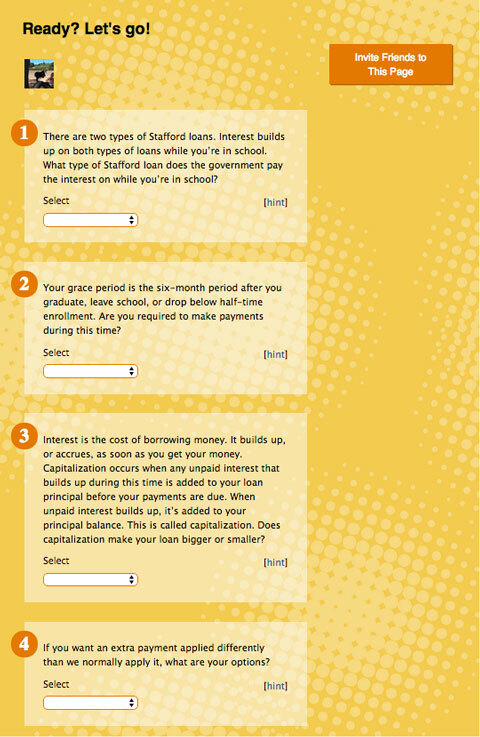 The quiz focused on the most common questions that Great Lakes sees from their borrowers. Using a fun element like a quiz can encourage more people to enter a contest. Great Lakes’ fun, optional quiz was a direct, non-invasive way to start the communication about student loans on their Facebook page. Once fans took the quiz and saw their results, it didn’t take long for them to begin coming to the Great Lakes Facebook page to get answers to their loan questions. Offering quick customer support via social media can open communication between brands and their followers. Once the promotion was posted, Great Lakes played an active role in continuing engagement on their Facebook page and Twitter account. 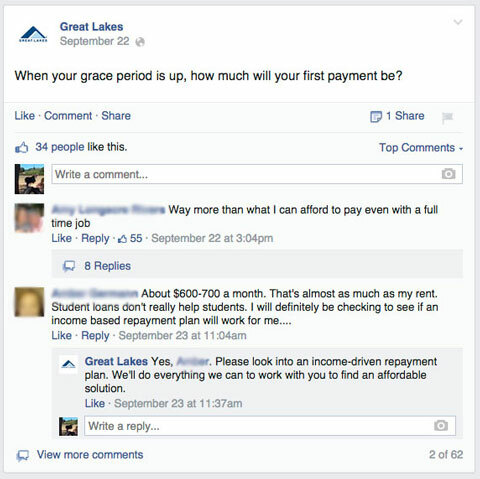 Since borrowers constantly have questions about their student loans, Great Lakes wanted to make sure they were available to answer as many questions as quickly as possible on their Facebook page. During and after a promotion, it’s important to be readily available to answer questions and comments on your brand’s Facebook page. Hundreds of fans liked, commented on and shared the sweepstakes and were exposed to the additional resources and tips that Great Lakes was posting on their page. Compared to September 2013, the percentage of fans who had a direct conversation with Great Lakes on Facebook tripled. Mix up reminders of your giveaway with best practices and relevant tips for your audience. “We’ve been able to reach out to more than 600 borrowers this month through social media to communicate with them on some level as a result of our sweepstakes,” said Swoboda. “Before our giveaway, a lot of people didn’t realize that we were on social media and that they could reach out and ask questions or get the type of assistance they’re getting,” she said. Great Lakes encouraged users to enter their promotion and openly communicate their questions and concerns through Facebook. Offering a relevant prize has always been a best practice, yet many businesses still don’t keep this in mind when deciding what to give away for their sweepstakes. By offering $6,000 to put toward a student loan, Great Lakes immediately positioned themselves as a servicer that cared about helping borrowers pay off their loans, resulting in an outpouring of positive posts on their Facebook page. They received more than 206,000 entries for their promotion. In addition, fans were more willing to share the promotion with their friends who were also dealing with paying for their student loans. Using a widget, 2,697 people referred their friends to the 6K Student Loan Giveaway. Great Lakes’ Facebook posts reached more than 150,000 people and more than 20 colleges posted about the promotion on their Facebook pages or websites. Offering a relevant prize often results in more engagement. Great Lakes ran their entire promotion without using an advertising budget. They sent one email to eligible customers to announce the sweepstakes, but did no additional advertising. By picking a relevant prize, asking their fans what they wanted to see, offering an interactive element and allowing anyone to enter without forcing a like, their results were entirely organic. What do you think? 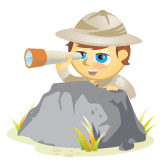 Have you found a way to improve communications with your online audience? Have you positioned yourself as a trusted resource for their questions and concerns? Let us know your experience in the comments section below.